Baldwin Beach is considered the premiere beach on Maui’s north shore. It’s a classic white sand beach that stretches along the ocean with no hotels, condos, or developments fronting the beach (unlike many other popular beaches on Maui). Although once upon a time, someone tried to build a beachfront house here called - the Montana Beach House. The far left side of Baldwin Beach, to the east towards the airport, is called Baby Beach. The lava rocks and coral reef create a safe and shallow swimming area for mothers to take their babies and young children, hence the name. The far right side of Baldwin is called “The Cove” and is also sheltered for swimming. The ironwood trees provide shade and there are often drummers and drum circles, hippies and slack rope walkers and it can be a real party scene. Past the cove, there is a walking path along the coast that goes to another beach in Paia. There is plenty of beach for everyone to find their own spot here, with lots of sand around them, or close to other people. The views are beautiful, with the mountains in the distance, the clouds, and sparkling water. Baldwin Beach is popular with everyone: visitors, local families, honeymooning couples, people seeking solitude and meditation, young people who want to meet and mingle, body boarders, swimmers, lovers of sunsets and beach walks. It’s not considered a good snorkeling beach, especially in the afternoon, when waves may get rougher. It’s also not a place for camping. Late afternoon photo at Baldwin Beach, towards Central Maui and Mauna Kahalawai, or the West Maui Mountains. It can be crowded with lots of cars especially when there are community events.When it's busy, cars are parked all the way along the entrance road and along the highway on both sides of this entrance. 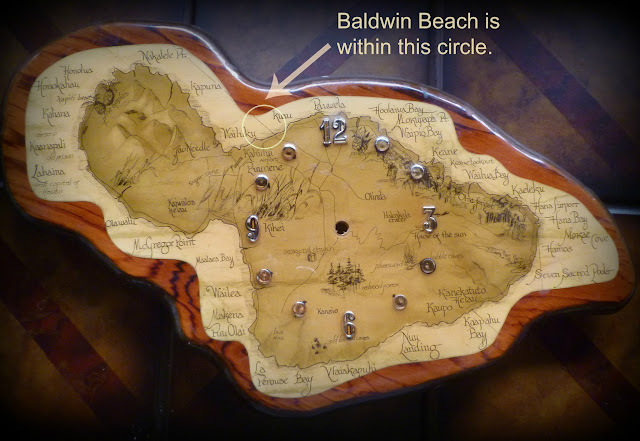 This is an old map of Maui, that is also a clock. It's much easier to read the map without the hands. Baldwin Beach is located in a town called Paia, on the north side of the island. Strangely this map doesn't include the town of Paia, which is a significant town on the north shore, but a much smaller town (or townlet) called Kuau!